There are so many Rockchip RK3368 TV boxes on the market that it’s difficult for products to stand out. 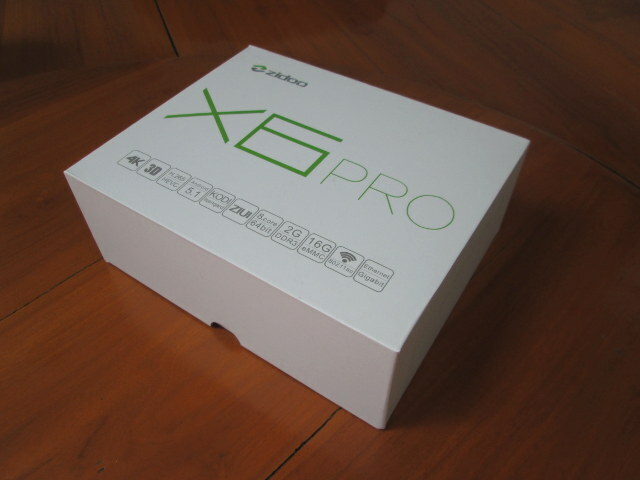 But Zidoo X6 Pro might be one of these products bringing a little more, as beside frequent firmware updates, Zidoo’s RK3368 TV box may be the first to officially run Kodi 15.x, while most others manufacturers have decided to stick with Kodi 14.2 in their latest firmware, and the company also released Kodi source code modifications for 7.1 audio pass-through, 3D MVC support, and hardware video decoding in compliance with Kodi’s GPL license. 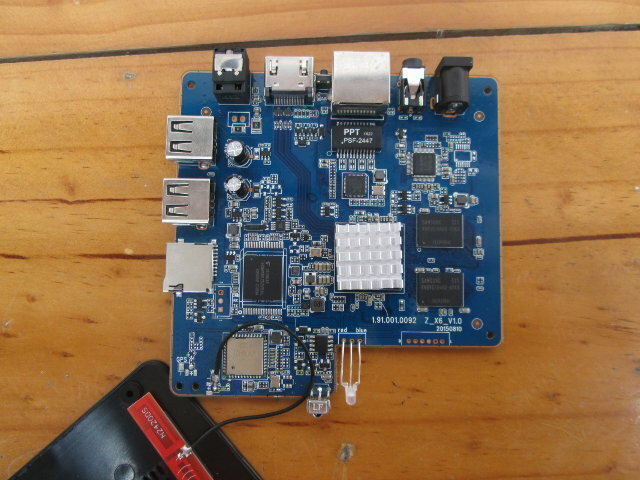 As usual, I’ll start by taking some pictures of the device and board, before writing a full review in the next few days. I got the following package via DHL, which somehow decided to take my picture as I received the parcel… The package includes some of the key features of the device include 4K, 3D, and HEVC supports, Android 5.1 and Kodi Isengard, 2GB DDR3, 16GB eMMC, 802.11ac and Gigabit Ethernet. 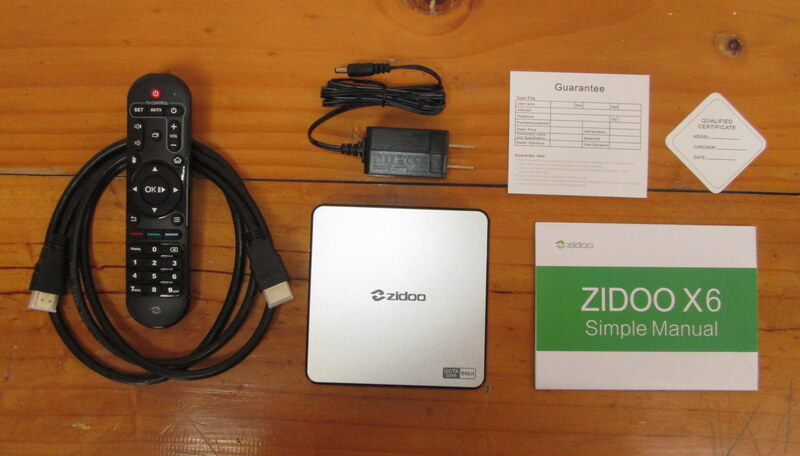 The package includes an IR remote control with IR learning function, an HDMI cable, a 5V/2A US power adapter, a guarantee card, a “qualified certificate” and Zidoo X6 “simple manual” in English. The case is made of plastic and is pretty light. 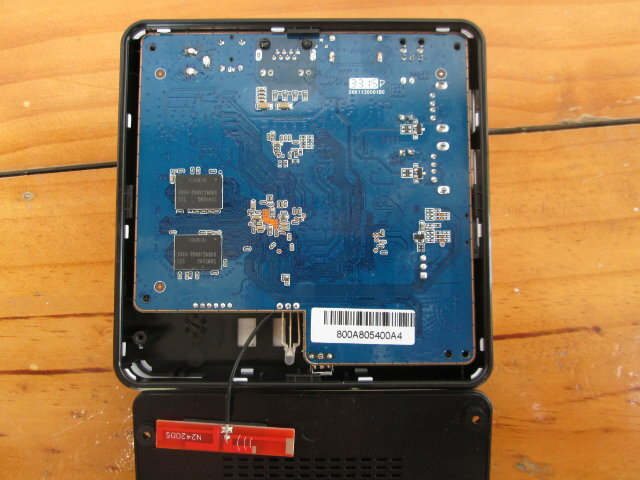 A small window on the front is used for the IR receiver and power LED, while two USB ports and a micro SD slot can be found on the side, with all other ports on the rear panel: 5V DC jack, 3.5 mm CBVS (composite + stereo) jack, Ethernet RJ45 port, HDMI 2.0 port, and optical S/PDIF port. There’s also a small pin hole between Ethernet and HDMI for firmware recovery. The bottom cover comes very easily after taking out four rubber pads and loosening four screws. .. two more can be found on the top for a total of 2 GB RAM. A Toshiba THGBMBG7D2KBAIL eMMC is for storage (16GB), Ampak AP6335 wireless module brings 802.11 b/g/n, 802.11 ac and Bluetooth 4.0 connectivity, Gigabit Ethernet is implemented with PSF-2447 and Realtek RTL8211E Ethernet transceiver, while Rockchip RK1000-S adds TV out and an audio codec. The board name is Z_X6_V1.0, so this likely confirms the board has been designed specifically for this product. Other interesting details include a 3-pin (GNX, Tx, Rx) header for serial console, a 9-pin header (not sure what it is for though), and on the bottom left corner reference to GPS, so they may have plan to add GPS for automotive computers or digital signage using a module such as Ampak AP6476 which integrates WiFi, Bluetooth 4.0, FM and GPS. Zidoo sent me the sample for review, and distributors can contact the company via Zidoo X6 Pro page. Individuals can purchase the product on Geekbuying for $99, and I could also find it on eBay ($120) and Aliexpress ($99). Too bad there is none of those boxes with a decent SATA connector, even an eSATA one for external drives. There is probably very little demand for SATA drives in Android devices. Archos used to make Android tablets with internal HDD, but they did not sell well. Allwinner A10 SoC came with SATA, and MeLE A1000 was a nice little product, but Allwinner decided not to include SATA in its newer chips, again probably because demand was low. There are still a few ARM SoC with native SATA, but usually for higher end devices. I think some Broadcom & Marvell SoCs, and the latest HiSilicon SoC have SATA. A link where we can download the firmware for this? Next week the sample tuner will be shipped to you JL. The only have Kodi, and their own apps however. I can’t see any Linux kernel there. Someone can use this tool to dump the firmware and zip it. Then connect power cable to device while holding recovery button with a pin. It will connect to flash mode and the tool will be able to dump the firmware. You can use the same drivers & flashtool from Tronsmart and see if the device is in flash mode. Any word on any Linux distros coming to RK3368? RK3368 is not that interesting for Linux, as it’s slower than RK3288 for most tasks. Its main advantages being slightly lower price, better HDMI 2.0 support, and H.265 2160p60 video decoding, but the latter is not something that would be supported in Linux, at least for now.